The Dress Room is a dynamic room. It moves. It adapts.The floor senses where you are. The room responds. It follows. Stops. It is a dress you wear. Sometimes it fits, sometimes it misbehaves. It blurs the boundaries between architecture and the clothes we wear. With this installation we explore the expressions of a dynamic room.Whatdoes it mean to be fully immersed i the interaction? How does it feel? What does it make us do? What does the interactivity mean for the sense of the room? For more information see this descriptive video of the Dress Room, or look at the four different forms of interaction as danced by Nana. 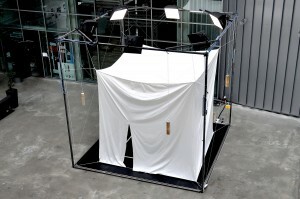 The installation consists of a steel frame of 5 x 5 x 5 m with a suspended textile tent inside measuring 3,75 x 3,75 x 3,75 m. The tent’s shape and placement in the frame is controlled through wires and eight pneumatic pistons. The movements inside the tent are sensed through a grid of simple connectors in the floor. 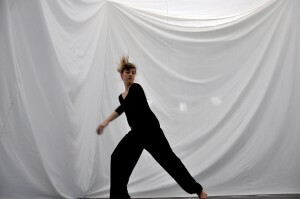 We explored the room through s series of improvised dances performed by a professional dancer.